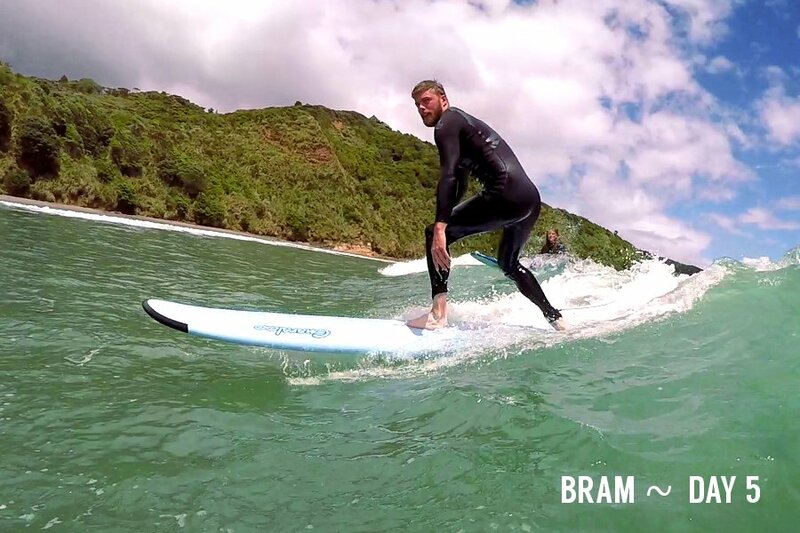 My main aim is for you to actually feel like a surfer at the end of one of my surf courses – Ready to surf on your own with confidence. 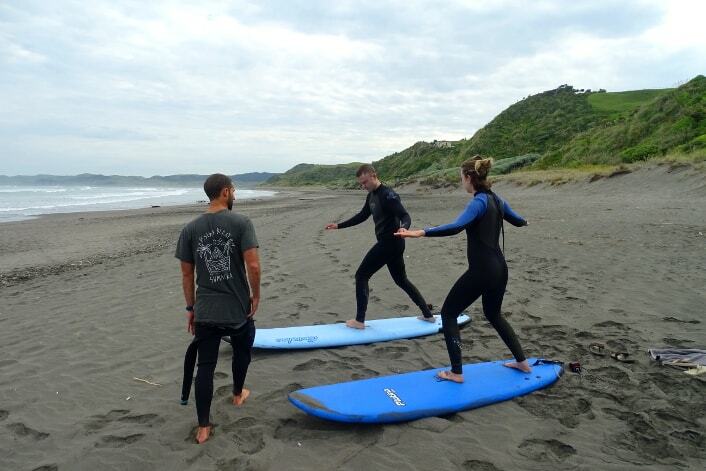 This surf course is for anyone who wants to learn to surf and become a competent surfer quickly via professional coaching in a small group environment. It will suit those that have never surfed before as well as those that have surfed a little bit but are struggling with the basics. You don’t need any prior knowledge of the ocean, I cover all that in a practical easy to follow way. If you do have some experience, whether from surf lessons or going it alone, I think the detail in this course will quickly highlight any gaps in your skills and get you on the fast track to improving. Why do you want to Surf? Over the years I’ve found that people take surf lessons for different reasons. Some just want a one-off experience, to give surfing a go. In that case I offer one of my standard surf lessons. But I’ve also noticed that many beginners already know they want to become surfers and make surfing a part of their lives. I love helping these kind of surfers get into the sport. If you’re one of these people I’ll give you a word of warning – most learn to surf lessons are designed to give a one-off experience and don’t really go into the detail required to get you off to a good start in your mission to become a surfer. I’ve designed this beginners surf course especially for you though. It includes all the skills, techniques and knowledge you need to progress beyond standing on a little whitewater wave to paddling out and riding real unbroken waves with confidence. Since starting these surfing courses in 2012 I’m absolutely stoked that I often see past customers continuing to enjoy their surfing and progress nicely on their own. Many of them keep in touch with others they did the course with, become friends and several have even progressed on to our international surf trips, surfing tropical reef breaks in Indonesia. 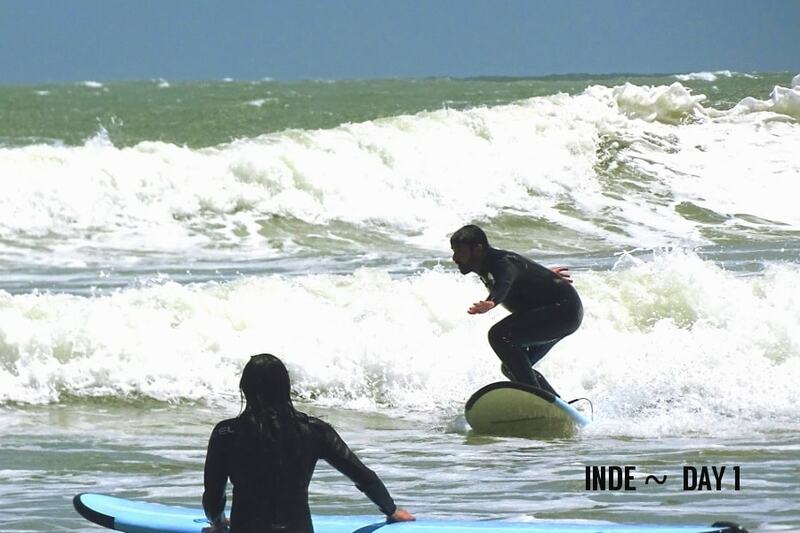 We assume you want to keep surfing on your own, or are already a novice surfer, therefore we provide a surf coaching service rather than a tourism experience. No two lessons are the same, we assess where you’re at and coach based on your level, total beginner or someone with a little experience already. There are a lot of skills you’ll need to be a surfer and many of them aren’t physical. If you want to continue learning to surf on your own you need to know how to find suitable waves, read weather patterns, understand the tides, purchase the right equipment, adjust fins, wax your board, learn the politics of a surf spot, know how to tie boards on your roof and so on. You could learn all those things the slow way and the hard way but if your not 13 years old with endless amounts of free-time, why not speed up the learning process? To be honest, many surf schools don’t teach the stance or pop-up correctly and this can limit your progress in the future. We hone these with clear instructions and also use video analysis. Our group size is capped at 5 so that we can give you constant feedback during the course, after every few waves to be precise. This individual attention also allows you to ask us all your questions. We don’t want to confine you to the whitewater, and if you’re up for it, we’ll take you out to catch real waves asap. But only if you’re keen, we won’t force you if you’re not ready. We focus on helping you get good quickly but part of that involves gopro videos and photos, which we send to you for free afterwards. You will get 100% clarity on the same pop up technique that good surfers use and then we will chip away until it becomes 2nd nature for you. This is vital for continued progression in green waves later on. If you’ve found the pop-up difficult in the past, it’s likely you have not been taught correctly. Your stance will be fine tuned until you can ride each wave all the way to the beach, maintaining speed and control. At this stage you will be in the whitewater waves, close to shore because it allows for maximum repetitions – vital for developing these basic skills. You could easily catch 50 waves per session. 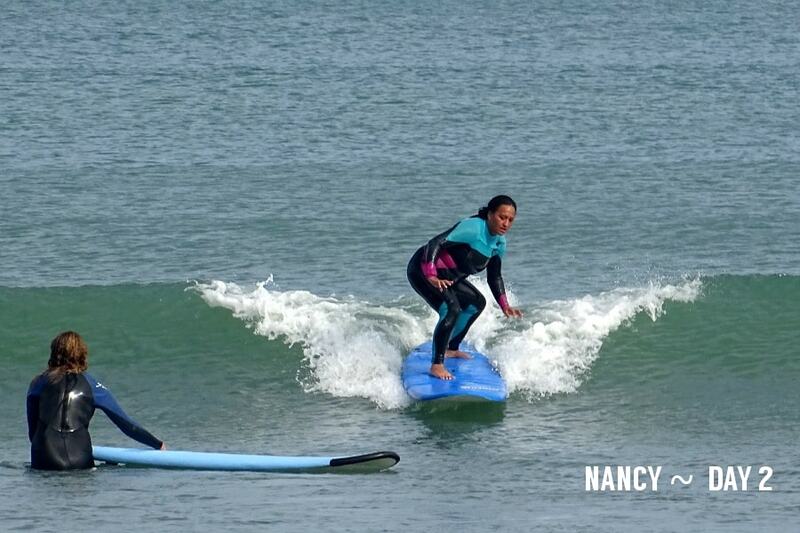 Today it’s all about using our rails (sides of the board) to surf across waves rather than straight to the beach. Once you learn the ‘angled takeoff’ you will almost never go straight on a wave again. This will prepare you for green wave riding on the open face. You will experience more speed because once ‘on rail’ there is less drag in the water. We will start catching small unbroken waves and teach you how to make ‘the drop’, it’s all about timing, where you look, and body position while paddling. 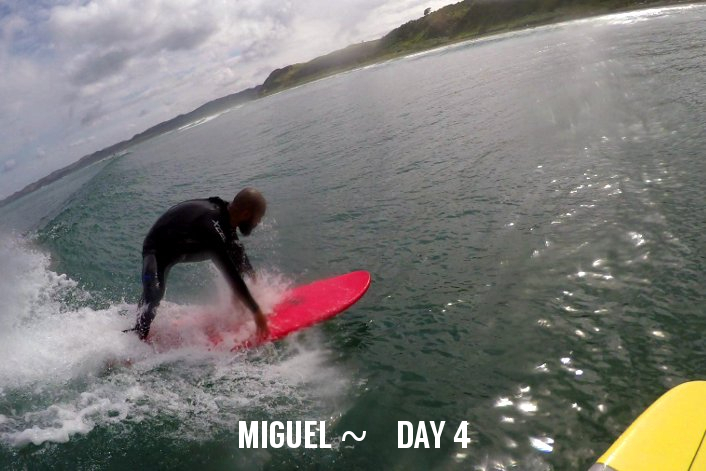 If you are one of those beginners that has no fear, on day 4 and 5 we’ll be happy to help you take off on good size waves and all going well you’ll get a real sense of what good surfers do! Debrief – understand what you need to work on to keep progressing, the logical order to increase your skills, when to go to a smaller board if thats your goal, and get tips on things you can do to speed up your progress. 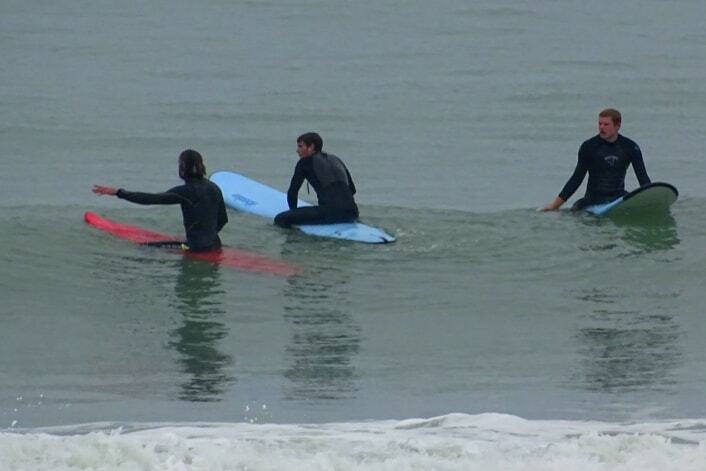 Another thing I’ve noticed while doing lessons is that some people think learning to surf is all about standing up. They think that if they can stand up they’ve succeeded in becoming a surfer, or if they can’t stand up easily they think there is no hope for them. Learning to stand up is important but it’s not something you need to become obsessed with. Some people find it easy, others find it tricky – especially if they lack flexibility, but with persistence it gets easier and easier. I hope the following two video clips (excuse the poor quality – will update them soon!) will convince you that riding a real green wave should be your main goal. If conditions allow, it is very possible you could achieve this goal on your beginners surf course. This surf course is more of a commitment than you’ll need with other surfs schools, but if you really want to surf well I hope you’ll understand the logic behind it and give yourself the time to do this properly. The surf course is delivered in 2.5 – 3 hour sessions. All the basic techniques like the pop-up and stance are explained and practiced using simulations on the beach, in a quiet corner so that you know what to do and expect when you hit the water. We also break down the conditions and point out safety factors. On the first few days we’ll be without a board but assisting you in the whitewater, providing feedback after every wave you ride. Then when we venture further out, we’ll grab a board and paddle out with you to provide advice and encouragement. You can follow us into the sweet spot and we’ll talk through the incoming sets of waves to fast track your ocean knowledge and turn you into a wave magnet. For many, this is the best part of the course as they can fire away with all those questions – what size board should I buy? what wetsuit? 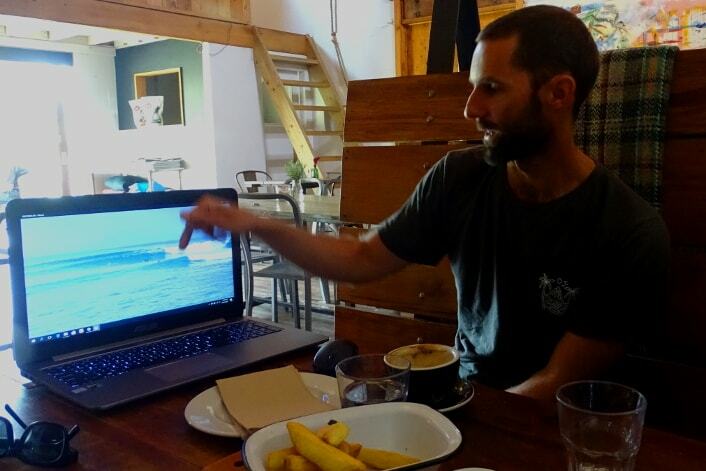 We can talk about your local surf spots and also review the videos and photos we have taken of you during the course. Seeing your technique on video is a great way to speed up improvement. 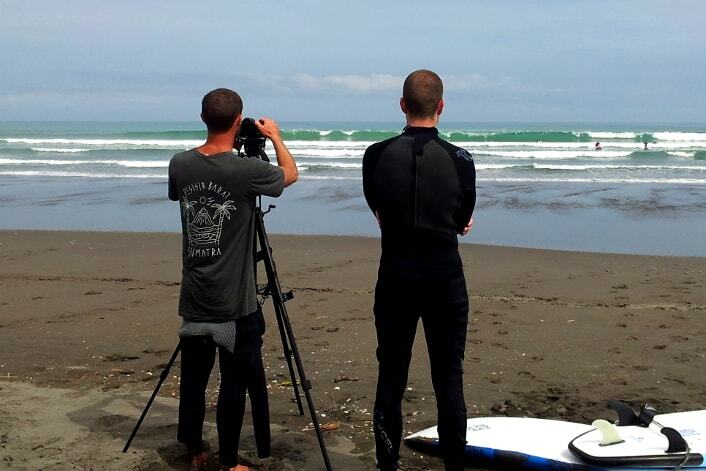 Why Learn to Surf in Raglan? 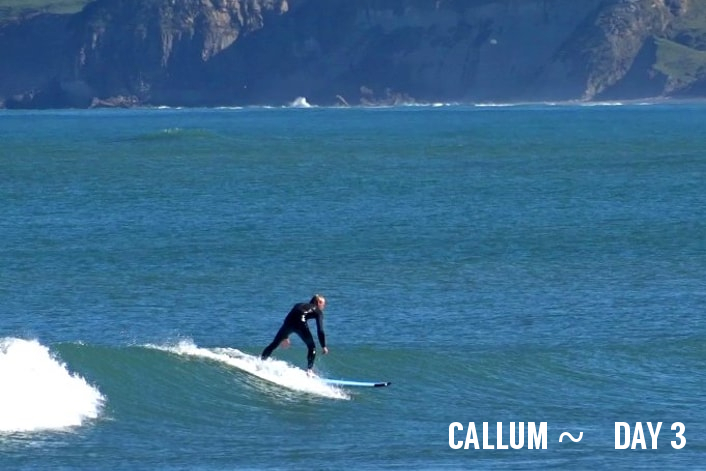 Raglan is one of the best surf spots in New Zealand. It is 2 hours drive from Auckland and lies on the west coast. It is one of the most consistent places to surf anywhere in the world because it gets constant swell and the shape of the coast here provides shelter from the south-west winds that ruin surfing conditions on other parts of the west coast. The local beach has gentle breaking waves over a forgiving sand bottom most days of summer and autumn. There are always waves – I’ve only seen it too small for beginners on one or two occasions. That’s the main advantage Raglan has over other New Zealand surf locations. 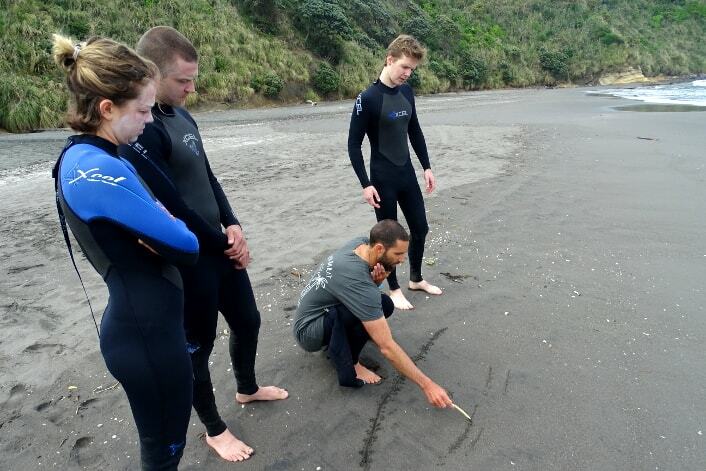 Many people who take this course are from Auckland or Hamilton and they often comment that the waves are much friendlier and longer than those on Auckland’s more exposed west coast beaches. 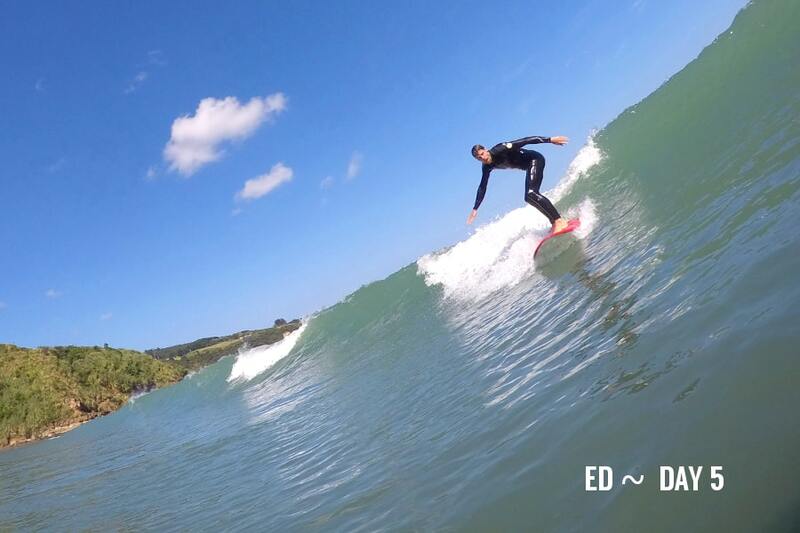 So in general, Raglan is an awesome place to learn how to surf – safer and cleaner waves than most of our west coast, yet there’s always a wave and no flat spells like the east coast. Plus, it’s one of the most famous surf towns in the world and has a great vibe – a must visit if you’re travelling from overseas. A “mentor” you can stay in touch with after your course if any questions come up, and if you keep practicing and progressing you can come on one of our group surf trips to the tropics! When do these learn to surf courses run? These courses can be taken at any time of the year. The waves are better for learning from November through to April and we have regular courses happening over this time. If you are booking by yourself, let me know your preferred dates and I will try and group you with a few others who want to learn at the same time because we need at least 2 people to run a course. If you are booking with a friend or as a group you can usually choose any date that suits you and we can run the course then. Because each course is limited to 5 people it pays to make bookings well in advance to avoid missing out, especially over peak holiday times like late December, January and early Feb.
What time of day do lessons happen? We confirm the lesson times with you a few days before your course begins, based on the surf and weather forecast. This way we get the best possible waves for you. It is usually in the morning, but not always. We can also be flexible and work with your schedule as much as possible. What happens if the weather is really bad on the dates I booked? We don’t mind whether it’s sunny or raining but we will cancel lessons if the surf conditions are terrible or dangerous. It doesn’t happen often, but when we do have to cancel a lesson, we either postpone the lesson to a later date or offer you a refund for the day you missed out on.